After launching its new Spin & Go fast-paced online poker format in the UK last month, PokerStars is now running a week of special Spin & Go Week promotions promising to hand out a range of tickets and cash prizes. The Spin & Go format consists of fast-paced tournaments offering lottery-style prize pools and has proved a big hit with players with over 7.5 million games played so far. 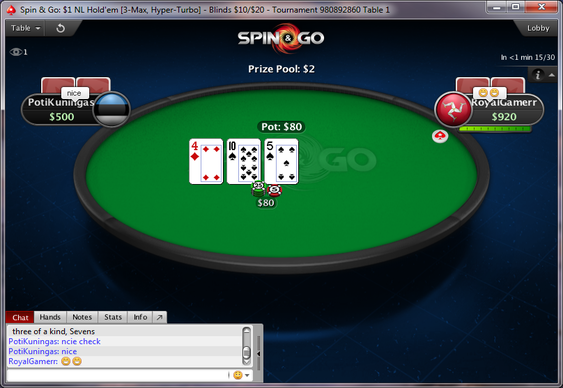 Spin & Go games take place at three-handed hyper-turbo Sit & Go tournaments with buy-ins of $1, $3, $7, $15 or $30. Players starts with 500 chips with the clock set at 3-minutes. Once all three players are registered to a game, they watch the spinning numbers on screen to see how much the prize pool for that game will be worth – anywhere from 2x the buy-in to 1000x the buy-in. Until Sunday, PokerStars will be running the Spin & Go Daily Challenge offering players the chance to bag free Spin & Go tickets in addition to cash prizes. Those making a minimum deposit of $25 before October 19 using the bonus code ‘SPIN5’ will instantly receive five tickets worth $7. PokerStars is additionally offering its Spin & Go First Deposit Bonus promotion for those parting with at least $20 before October 26. Using the bonus code ‘FREE20’ will see competitors receive $20 in bonus cash plus a bundle of randomly-valued Spin & Go tickets.